Viruses Could Epigenetically Modify a Person’s DNA | What is Epigenetics? Viruses can cause many different health problems in humans including HIV/AIDS, hepatitis, herpes, and even cancer. They are an extremely small foreign organism that invade healthy cells, and seek to wreak havoc in a healthy human or animal. Viruses are comprised of either RNA or DNA covered in a protein shell, and cannot reproduce on their own, so they rely on their host to survive. Once a virus is inside the body, it hijacks the machinery of healthy cells by inserting its own DNA into the cell, allowing the cell to manufacture more of the virus. It turns out that viruses have evolved the ability to do this with virtually no consequence because they can epigenetically inactivate a healthy immune system, not by shutting it down completely, but by muting it, rendering the immune system useless in combating the virus. One of the most detrimental viruses to the human body is the human papillomavirus (HPV), which is responsible for over 500,000 cases of cervical cancer annually, all over the world. HPV is spread by skin-to-skin contact, and is divided into two types—low-risk HPV and high-risk HPV. Many people have low-risk HPV, which cause warts on the skin or in mucous membranes (male and female genitalia) and rarely cause cancer because they are typically cleared by the immune system. When the immune system can’t fight the HPV infection, the risk for cancer increases and it becomes high-risk HPV. In a recent study out of University of Colorado Cancer Center, Dr. Sharon Kuss-Duerkop and Dr. Dohun Pyeon discovered that viruses are able to suppress gene expression via DNA methylation, specifically by targeting DNA methyltransferases (DNMTs). The researchers explained that the viruses target regions of the genome known as DNA promoter regions, which are sections of DNA that initiates the transcription of a particular gene. These regions are abundant in CpG nucleotides and act as switches for gene expression. When they are hypermethylated (too much methylation), they are essentially turned off, which also silences that gene. (A) Viruses activate immune gene expression to induce an immune response. Proliferation can be blocked, preventing cancer development. (B) Viruses hypermethylate immune genes, silencing immune response, promoting cancer development. See full image in Viruses. Interestingly, the virus does not directly methylate this area itself, but instead recruits the person’s own human proteins to do their dirty work and methylate the region. “Viruses encode particular proteins that can in some way modulate DNA methyltransferases,” Kuss-Duerkop said. Viruses elect to turn off genes like interferon-b that the immune system regularly enlist to fight foreign pathogens which allows them to replicate quickly and run rampant. This could lead to cancer development. “Ultimately, the virus is suppressing the immune system for its own benefit, and promoting the formation and proliferation of cancer cells may be just a side effect of that,” said Sharon Kuss-Duerkop. The environment that the virus creates enables tumor cells to hide from the immune system’s defenses, which could allow the tumor to spread more easily. This is not all bad news, however. The discovery of this viral process highlights the areas where researchers can dial up the immune system in order to intensify the combat against these cancers. There has been recent success in employing an immune checkpoint inhibitor PD-1, which essentially removes the proteins that camouflage the cancer cells from the immune system, allowing T-cells to destroy the tumor. Another immunotherapy being considered is CAR-T cell therapies, which utilize specifically engineered T-cells to seek out and destroy certain cancer-specific proteins and their associated tumors. Though these treatments have been effective in some patients, other patients do not respond the same way, so future research is needed to discover how these therapies can be universally effective. Kuss-Duerkop suggests that perhaps the answer lies within the demethylation of the known promoter regions associated with virus-caused cancers. “You don’t want to just turn down methylation globally, which would result in over-activation of all genes in the cell, but demethylating some of these gene promoter regions selectively could revive an immune system muted by cancer-causing viruses,” he noted. Viruses have evolved their own methods to ensure their own survival. The fact that they are able to epigenetically modify a person’s DNA is undoubtedly dangerous to human health. Kuss-Duerkop hopes that the information discovered in this study can help develop future treatments that involve revitalizing the patient’s own immune system to combat these sneaky viruses and the diseases that they cause. Source: Kuss-Duerkop, S. et al. (2018). DNA Tumor Virus Regulation of Host DNA Methylation and Its Implications for Immune Evasion and Oncogenesis.Viruses, 10 (2): 82. Reference:University of Colorado Anschutz Medical Campus. 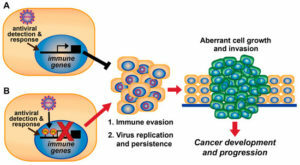 “Here’s how viruses inactivate the immune system, causing cancer.” ScienceDaily. 2 March 2018. Web.